The 7 instant coffee brands we taste tested. We gathered a panel of four expert coffee drinkers for a blind taste test of seven of the top instant coffee brands available. After all of our testing was done, Alpine Start won the day as the most flavorful instant coffee in our test. We were also impressed with Four Sigmatic Mushroom Coffee Mix for its strong and pleasantly unique flavors. Mount Hagen earned an honorable mention as a tasty cup of instant coffee with bonus points for being organic and fair trade. The classic Folgers turned out to be a decent cup of coffee for dirt cheap, making it our budget pick. Read on for our full reviews of each instant coffee. Alpine Start bills itself as “Instant Coffee That Actually Tastes Good.” In our blind taste test, most of our reviewers agreed. Alpine Start was also the one that had the highest points in our caffeine test, an admittedly subjective test based on how caffeinated the author felt after drinking one cup in the morning. Still, “Alpine Start” seems aptly named — we’d be happy to reach for this to get us going at 4am. Only one reviewer didn’t like Alpine Start, saying that it didn’t have the sort of strong coffee smell that gets you out of bed, and that it was too bitter. Another negative is that it was one of the more expensive coffees we tested ($1.12 per serving). Despite those negatives, its flavor and the fact that it seemed to pack the most punch put it at the top of our list. Of all the instant coffees in our test, Four Sigmatic Mushroom Coffee was the one that everyone was most excited to try. It totally lived up to the hype. It was definitely one of the most flavorful of the instant coffees we tasted. Four Sigmatic makes some big claims about increased focus, energy, and productivity associated with the Lion’s Mane and Chaga mushrooms. We didn’t notice anything more than a typical caffeine buzz after one cup, but it was sufficiently strong to satisfy our morning fix. The biggest reason Four Sigmatic Mushroom Coffee wasn’t our top pick was that we’d find it hard to replace our regular morning coffee with it. It’s unique, earthy flavor is great, but it’s more of a novelty. After drinking one cup, we found ourselves starting to miss the flavors of normal coffee. It’s also the most expensive coffee on our list at $1.50 per serving. While this may not be the best go-to instant coffee for every camping trip, if you’re looking for something unique to try, we highly recommend it. Mount Hagen impressed us as much with their mission and philosophy as with their instant coffee. The Germany-based company claims to be the first to produce certified organic instant coffee and does a lot to promote fair trade and organic practices. The flavors didn’t quite hold up to our winners but were still pretty good. It did have a little more of a typical “instant coffee” taste than our top pick and runner-up. It still had a strong enough flavor and respectable caffeine content, though. Mount Hagen also gets bonus points for being organic and fair trade without being outrageously overpriced. At around $0.28 per serving, it’s not the cheapest in our test, but we think it’s a good value for the quality. While Folgers didn’t quite compare with our top picks, it was surprisingly decent. The biggest negatives were that it had a slight “artificial taste,” was a little bland, and didn’t have much of a satisfying coffee smell. Everyone was in agreement that although it wasn’t their favorite, it was still a decent cup of instant coffee that no one would complain about drinking. At the dirt-cheap price we paid of around $0.05 per serving, it’s a perfect option for anyone who just wants a really inexpensive way to get their morning caffeine fix out in the wilderness. For our taste test we bought the jar of coffee crystals, but you can also get this brand in single-serve packets. Depending on your personal preference, a ziplock of loose crystals or a handful of individual packets might be the better option for your camping and backpacking trips. Starbucks VIA was the most polarizing instant coffee in our review. Three of our reviewers immediately hated it, and one loved it. In our blind taste test, only one of our testers liked this one. For her, it had the strongest smell and flavor and was closest to the dark roasts that she typically drinks. The VIA also had a decent caffeine content, scoring in the top three in our caffeine test. For most of our reviewers, Starbucks VIA was overrated (and that’s being nice). If you like very darkly roasted beans and a bitter flavored coffee, then this may suit your preference. Otherwise, steer clear. “All dressed up with creamer and sugar,” Trader Joe’s packaging claims. For the half of our taste testers who prefer their coffee black, that was immediately gross. The two taste testers who typically drink coffee with cream and sugar weren’t impressed, either. One said that the only good thing about it was the convenience of having everything already mixed together. Another’s highest praise was that she would drink it if it was the only option available, but she would never seek it out. It was definitely high on the creamer and sugar content. Only one of our tasters found this even remotely close to how he likes his coffee, and even then he wasn’t too stoked on the flavor. Overall, unless you’re just totally sold on the convenience of having instant coffee, creamer, and sugar all pre-mixed for you, we’d recommend giving this one a miss. Although only one reviewer actively disliked Nescafe Taster’s Choice, no one really liked it. It wasn’t awful, but we’d pick Folgers over Nescafe for a super cheap instant coffee. Spray-dried or Powdered – The drying process uses hot air to remove the water from the coffee, producing a fine powder. This is the more common way of producing instant coffee. Freeze-dried – Freeze drying involves bringing the coffee quickly down to temperatures as low as -40 degrees F before dehydrating it. It is generally believed to preserve the flavors slightly better, and it produces a coarser textured coffee. Individual Packets – For backpacking and camping, these are ideal for convenience. Each packet contains a single serving, although most coffee drinkers we know prefer two packets per cup. Loose Powder/Crystals – Some campers prefer to bring a ziplock bag full of instant coffee instead of messing around with individual packets. A jar of loose powder or freeze-dried crystals can be incredibly cost-effective, and it saves having to pack out a lot of waste. Taste is subjective, and sometimes the best way to find your go-to brand is to let your taste buds be your guide. 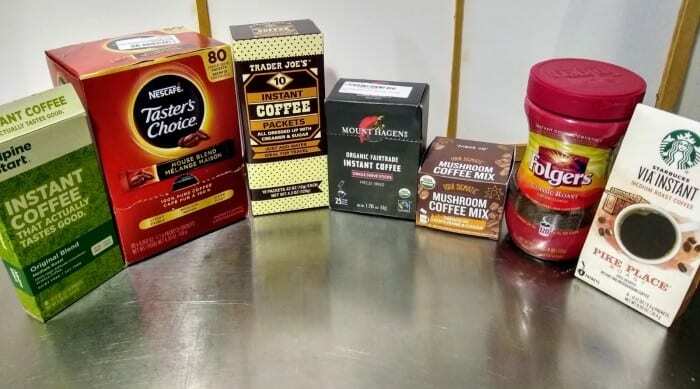 Since you realistically can’t sample every instant coffee out there, we recommend starting with brands and flavors that you already like to see if they have an instant coffee version. Another big part of choosing the right instant coffee is accepting the fact that it will just never taste as good a fresh brewed coffee. But if you find the right coffee, it can get pretty darn close. Changing the proportion of coffee to water can help customize taste. We made each instant coffee according to the instructions on the packaging, then assigned each one a number. Our tasters sampled and gave their comments on each cup without knowing which brand it was. After everyone had tasted all of the coffees, we added cream and sugar. Those who typically drink their coffee with cream and sugar then tasted them all again to give a more accurate opinion. Note: Since Trader Joe’s Instant Coffee was pre-mixed with cream and sugar, it was easily identified during the blind taste test. However, we don’t feel that this swayed our taster’s opinions. For this super subjective test, the author of this article replaced her morning cup o’ Joe for a week with these instant coffees, then ranked the coffees based on how caffeinated she felt each day. Setting up for our blind taste test.